If you are thinking of replacing your gutter system or you are building a home and need to install a gutter system for the first time, then you want to make sure that you get all the necessary parts for the system. Gutters are not just a combination of straight pieces, some horizontal and some vertical. There are special pieces called downspouts for the vertical pieces, elbow to turn corners, and special connectors to fit pieces and downspouts together. I will try to summarize the different types of gutter parts here. The majority of your gutters will be straight gutter pieces cit to various lengths. These pieces can be made of a variety of materials. The most common gutter material of construction is aluminum. Most aluminum gutter pieces that you buy come already painted or finished in some way, but you can also purchase galvanized gutter pieces that are untreated. In this case, you can treat them to match your siding or façade. Another popular material, especially for do it yourselfers, is vinyl. Vinyl is a good choice if you are trying to install your gutters yourself because it is lightweight, easy to cut, and easy to move around. Plastic is also a material possibility, but they are not very durable and do not hold up well over time. 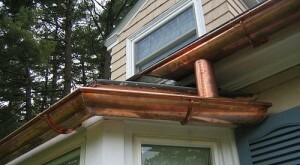 There are even copper gutter systems. There are two main shapes for your gutter system and three popular sizes. You need to make sure you pay attention to these options in your straight pieces so you know what types of connectors and elbows to get. You can have gutters that are half round or K-style. The half round gutters look like half of a cylinder. The K-style has the side next to the house go straight down and the bottom is straight across. The outside of the gutter goes out is a shape that resembles a K. This style does not really matter when it comes to how affective they are, but there is an aesthetic difference. In terms of the sizes, gutters can come in four, five, or six inches. If you think you need a larger size, it may be possible to special order something. Of course, the last thing you need to think about when choosing your straight gutter pieces is the color and texture. You want to pick a color or texture that matches or siding or whatever the façade of your house is. Make sure to keep in mind the color of your roof shingles. The downspouts are the pieces that go from the gutters at the roof line to the ground. They are an essential piece because they are what carries the possible damaging water away from your home’s foundation. When choosing the size and number of downspouts you need to think about how much rain water you need to accommodate. It doesn’t matter hoe big the gutters are, your downspouts are the limiting factor when it comes to water capacity. 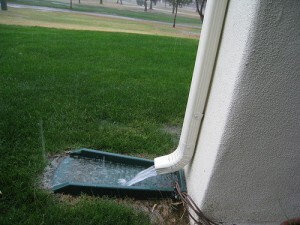 If you find after installation that your gutters are overflowing occasionally, then you might want to go back later and add an additional downspout. The shape of downspouts is generally rectangular. Popular sizes are two by three inches, three by four inches, or four by five inches. Sometimes downspouts need to change direction or be diverted around an obstruction. If that is the case, then you need an elbow or two. They are pieces that can change the direction of a piece of gutter downspout by forty five degrees. There are special shoe style elbows with a longer exit length that are used at the bottom of a downspout to divert water away from the house and foundation. Every house has corners and turns that will need to be accommodated when you are hanging your gutter system. To accomplish those turns you use mitres. There are outside mitres and inside mitres. An outside mitre is used for an inside turn and an inside mitre is used for an outside turn. That means if your house was a regular square or rectangle with only inside turns you would need four outside mitres. There are also cases where you do not want to continue the gutter system and the line needs to end. For these instances you want to use an end cap. There are three systems used to attach different parts of the gutter system to the house. First there is the spike and ferrule system to attach the straight gutter pieces to the eaves of the roof. The ferrule helps to maintain the width of the gutter pieces and the spike is inserted into the roof through the ferrule to hold it in place. The hidden hanger and screw method is more common in modern construction because they make gutter cleaning easier. With this system the gutters are held up by a hanger which is attached to the house with a screw. Straps are used to attach the vertical downspout pieces to the side of the house.